Test and tune today was great! Finally getting use to the slicks. Ill post a video and more info later tonight. But for now ill just leave this here. New personal best! Im car 896. MorningZ, Built_not_bought and atkinsonar like this. It was some kind of a drag car. He let off on the back half. Alot of people will do that if they are just working on dialing in their launches or if their safety gear isnt up to spec for the times they are running. If your safety gear isnt up to spec then youll get booted from the track. Its crazy how much different the street tire line is from the slicks line. I was the only import in that line today and was running against big v8 drag cars with open exhaust and everything else. Even sitting in my car with the motor running I couldnt hear it running when one of the other cars were idling lol. The trailer brakes work great! Felt so much better pulling up to a stop light with brakes on the trailer. Usually when stopping you can hear the trailer hitch click and then the weight of the trailer pushes the Rango forward. Now it brakes just like normal. It was great to see you yesterday. Congrats on the new personal best. I saw you run 11.5. Don't get kicked-out from the track though, you are on the border-line . Yeah you too! Already have some ideas on what I need to change to go faster....should probably hold off until the IFO or DriveNW events for that lol. Been super busy with work so I havent had a chance to really go online very much to post the update. So I did get a new personal best on Sunday. From the video you can hear how much quicker the car sounds during shifts (except for shifting out of 3rd, hit the limiter a little ) with the full throttle shift activated. Instead of shifting, hitting the gas, waiting for boost to build then going it is just a quick shift then straight into boost without the lag. It also feels much smoother on the car since you dont get quite the jerk forward of letting up on the gas while shifting. Pretty happy with it so far. I think having it set at 7k is just the right spot. I am fairly certain I can get the car down to low 11s without spending anymore money. Just need some more seat time getting use to the slicks. Next timeout I will raising the launch control from 6500rpm (I think thats what its set to at least) up to 7000rpm. This should help with the car bogging down at launch and help with my 60ft. Just need to hope that the Duralast axles are up for it . 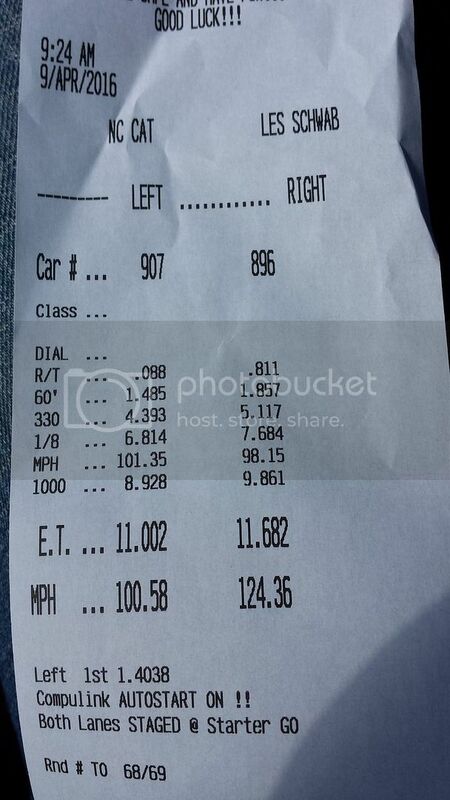 I was messing with tire pressures all day and was able to get a 1.760 60ft so that is in the right direction. I do need to get a cage VERY soon. 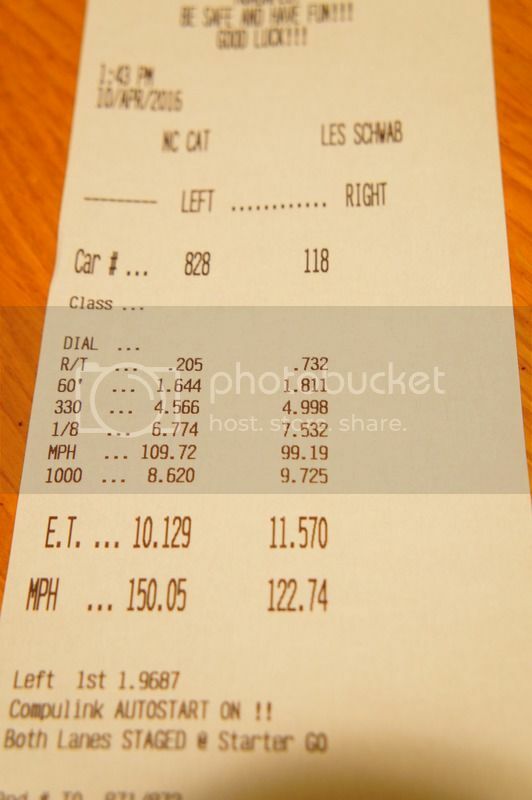 My best pass is 11.57 currently and at 11.49 I get booted from the track until I get at least a roll bar installed. I would rather just skip on just getting a roll bar and go straight for the cage so I wont have to worry about it for quite a while. Pretty sure I will be removing my deck and speakers in the very near future. The car is mostly a track car anyways so might as well shed some pounds. I will be needing to get a DD civic for my job so the deck will be going into that when I get it. I will be getting the OEM block off plate to cover the opening. Silvia, JDMJNKY and NewtGomez like this. "Why I decided to do this:"
Need better install !! a 50 cent piece of plumber's strap would solve that issue and you aren't going to gain anything by that "weight reduction"
It'll be a shame that those red Recaros got-2-go !! need roll bar/cage, fixed seats and harnesseseses soon ! I did lol. It works pretty good! Yeah maybe from 1st to 2nd. Its hard not to when youve always lifted while shifting. Im starting to get use to it. Deck and speakers were removed this morning. Just need to order the oem block off plate. I started my job a couple weeks ago so i havent had money coming in yet. I put the speakers, deck and the other small leftover brackets that were in the back and weighed it on the scale. Came out to 14.8lbs that i just removed. Id like to weigh my car again one of these days so i can see how much its down to now. speakers? hell i need some speakers for mine! I definitely recommend not wasting money on a roll bar. I regret getting my autopower roll bar and not going full cage. Would have been way better. Your times are getting insanely fast! It's 2 whole seconds than what I could get my dads 400hp supra to do lol.